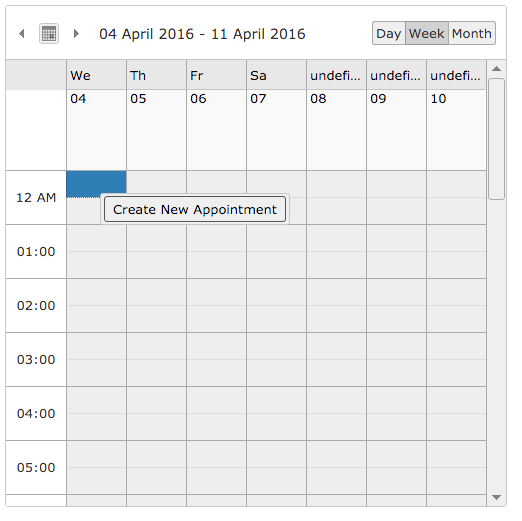 The jqxScheduler widget displays a set of Appointments in Day, Week, Month, Timeline Day, Timeline Week and Timeline Month views. jqWidgets is a commercial product, which depending on how you use it, requires a license fee. Complete details are on jqWidget's website. The product is well supported. This control is well documented on the jqWidget's website: http://www.jqwidgets.com/jquery-widgets-documentation/. This page was last edited on 4 September 2018, at 14:17.